They say that the floodwater came pungent and thick, the kind you could sink into and never rise from. It’s been eleven days since super typhoon Haiyan, locally known as Yolanda, hit land in the Philippines. 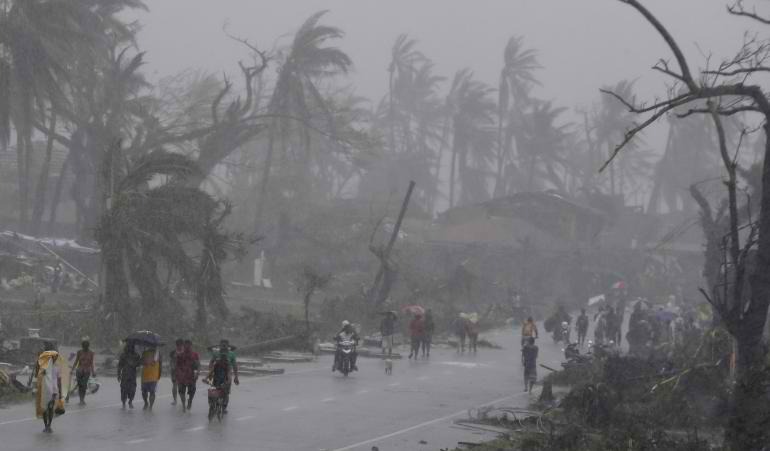 The news says it was the second deadliest typhoon to ever hit the country. A woman I met this week told me that her relatives described the sound of the storm like heavy weaponry being fired without stopping. On that night, I was enjoying a quiet evening at home on the couch, while outside the wind blew with incredible strength. It rattled the open screen windows in our living room. I did nothing more than marvel at the force of the wind, close the windows and say a breath of prayer for those braving the storm in harsher conditions. I yet had no idea of the heartache this one storm would cause. In my mind, it was just another typhoon, one of the very many we experience each year. “Super typhoon” was the term people were throwing around. In the days immediately before and after the storm, I stayed away from reading the news, insisting not to worry. Perhaps it was an exaggeration by the media, especially from nations unfamiliar with our local typhoons and cyclones. But really it was denial. People began to talk about the damage. Slowly the news from far-off Leyte and Samar trickled in. Calamity was more than confirmed. The world began to talk about it. And I continued to stay away from the news. Hearing about it was enough. Perhaps it was survivor guilt, or the mere physical distance from harm, or the crippling feeling like I couldn’t really help from where I was. By this time, I was flooded with messages from friends around the world, asking me if my family and I were affected by the storm. As it is when you are far away, many friends seem to have imagined the worst. Friend’s messages were full of incredible concern because to them, I could have easily been on any one of those islands that were struck with the hardest blows. I live far north of those islands, but those unfamiliar with Philippine geography wouldn’t know that. Messages kept coming in. Some of them thickened with worry. Many of them from friends I hadn’t spoken to in a long time. And more and more, these messages connected dots that drew lines closer and closer to me. Though I had felt so physically and emotionally distant from the tragedy in the Visayan islands, the storm was finally coming to me. 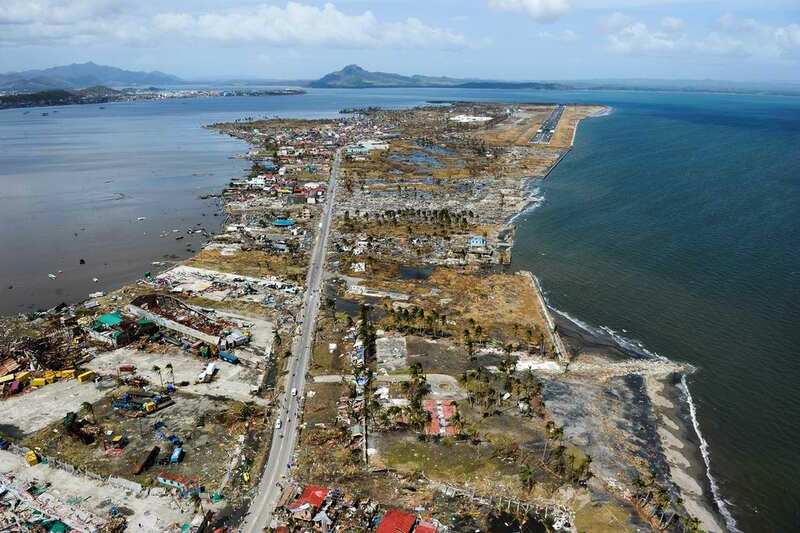 An aerial shot from a Philippine Air Force helicopter shows the devastation of the first landfall by Typhoon Haiyan in Guiuan, Eastern Samar province, central Philippines. From National Geographic. I haven’t even had a chance to respond to all the messages, but made sure to post a general message on my Facebook timeline, to ease any unnecessary concern for my safety. Much like the overflow of well wishes and concern in my direction despite my distance from tragedy, the Philippines is experiencing an outpouring of generosity from resources at home and abroad. The response to the immediate need has been incredible. In Manila, it seems we have all been mobilized- working on packing relief goods, raising funds or even driving survivors from one drop off point to their families in the city. A look through this collection of photos on the international response to the typhoon warms your heart. Sure, as with all disasters, there has been much talk about the pitfalls in the relief efforts, but to me that is negative energy we can do without. (I found this article quite appropriate.) There is still so much good being poured into the channels that need it. Let us continue to pour in. We sang this song in worship, Still, at church on Sunday. And the words just cut my heart. When the oceans rise and thunders roar / I will soar with You above the storm/ Father you are King over the flood / I will be still, know You are God. I sang. I closed my eyes. And there I was, standing in the expanse of flattened wreckage of the damaged cities, now all but rubble. As far as I could see was gray sky and brown ruin, not another person in sight. Tears ran down my face, and I finally mourned with the millions that survive the disaster. When the storm of this news has lost its power completely, and the world has moved on to respond to other tragedies, I will not move. I will not let this rest. When international concern has blown away, I will find myself standing in the rubble, praying over the land, and playing with the children who have survived. They say that the floodwater came pungent and thick, the kind you could sink into and never rise from. But life will be restored. And life will grow.